This Spring, the American Youth Symphony will treat its audiences to a series of appearances by a host of renowned guest conductors! 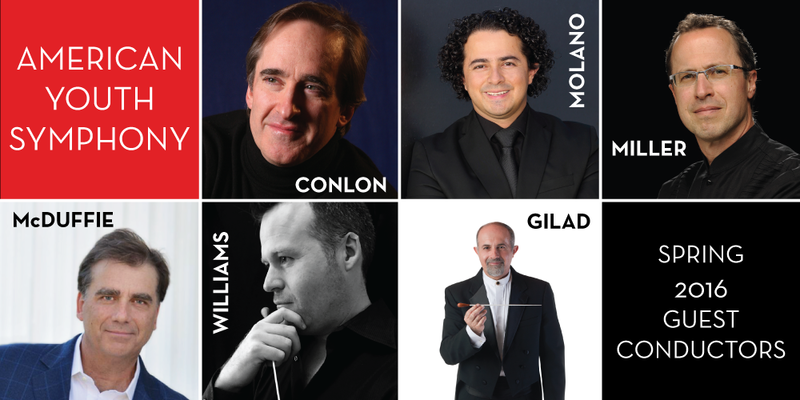 Collaborations with these varied and highly respected conductors promise a suite of concerts that will delight audiences across Los Angeles. The majority of AYS concerts are presented for free as a gift to the community – part of a long-standing commitment to eliminating all barriers to experiencing the remarkable beauty, power and inspiration of orchestral masterworks. Conducting the 11am Family Concert at Royce Hall on February 20th is Juan Felipe Molano. Maestro Molano is currently the conductor of the Los Angeles Philharmonic's Youth Orchestra Los Angeles (YOLA), and previously held that position with the Colombian Youth Philharmonic, Youth Orchestra Salinas (California), Caldas Chamber Orchestra, Cali Youth Philharmonic and Bogota Youth Philharmonic. During 2008-2013 he was the National Orchestral Director of Batuta Colombian System of Youth Orchestras (El Sistema - Colombia). This concert officially kicks off Maestro Molano's first season as a Resident Conductor with the American Youth Symphony. Maestro Molano will lead the orchestra in a program that includes Britten’s The Young Person’s Guide to the Orchestra, designed to entertain and engage both young children and classical music enthusiasts of all ages. This concert is presented at no-charge to the public and sponsored by First 5 LA and the Charles H. Kaman Charitable Foundation. At 7pm on February 20th at Royce Hall, AYS will be joined by not one, but two guest conductors. Conductor and Grammy-nominated violinist Robert McDuffie will lead the orchestra in Philip Glass’ The American Four Seasons, and Maestro Marc Williams will conduct Rimsky-Korsakov’s Scheherazade. Maestro McDuffie gave the world premiere of The American Four Seasons -- a work written for and dedicated to him by composer Philip Glass -- with the Toronto Symphony, and completed a thirty-city U.S. tour with the Venice Baroque Orchestra, pairing the Glass Four Seasons with the Vivaldi Four Seasons. He enjoys a dynamic and multi-faceted career, appearing as soloist with the world's foremost orchestras, while also occasionally sharing the stage with Gregg Allman and Chuck Leavell in "Midnight Rider," with actress/playwright Anna Deavere Smith in Martin Luther King's "Letter from Birmingham Jail," or playing Bach for Memphis Jook dancer Li'l Buck. Maestro Marc Williams regularly conducts various ensembles on the East Coast of the United States, having made his Carnegie Hall debut leading the New York–based contemporary music ensemble Second Instrumental Unit, of which he served as co-executive director and principal conductor. He also recently served on the conducting staff at Spoleto Festival USA for seven seasons as Resident Conductor and assistant to the Music Director. Maestro Williams is also a Resident Conductor with the American Youth Symphony this season. On Sunday, March 13th at Walt Disney Concert Hall at 2pm, AYS and the National Children’s Chorus will be led by Grammy Award-winning conductor David Alan Miller, current Music Director of the Albany Symphony, and former Associate Conductor of the Los Angeles Philharmonic. Frequently in demand as a guest conductor, Maestro Miller has worked with most of America's major orchestras, including the orchestras of Baltimore, Buffalo, Chicago, Cleveland, Detroit, Houston, Indianapolis, Los Angeles, Minnesota, New York, Philadelphia, Pittsburgh and San Francisco, as well as the New World Symphony, the Boston Pops and the New York City Ballet. Tickets range from $15 to $43, reserve now! On Friday April 1st, at 7:30pm at Royce Hall, LA Opera Music Director James Conlon will conduct the American Youth Symphony’s annual gala concert. Maestro Conlon, one of today’s most versatile and respected conductors, has cultivated a vast symphonic, operatic and choral repertoire. Since his 1974 debut with the New York Philharmonic, he has conducted virtually every major American and European symphony orchestra. Through worldwide touring, an extensive discography and videography, numerous essays and commentaries, frequent television appearances and guest speaking engagements, Mr. Conlon is one of classical music’s most recognized interpreters. This concert will be presented at no charge, and is sponsored by the Flora L. Thornton Foundation. AYS will complete its 2015/16 season with an intimate performance at the Ann & Jerry Moss Theater at the Herb Alpert Educational Village at the New Roads School in Santa Monica, on Saturday May 7th at 7pm. This concert will feature a solo performance from AYS alumna and rising star, Simone Porter, and will be conducted by Music Director of the Colburn Orchestra, Yehuda Gilad. Maestro Gilad has been lauded by the New York Times for his “strong imaginative programming,” and his innovative approach to music-making has earned him a reputation as one of today’s most dynamic and charismatic artists. A conductor, instrumentalist, and teacher, he he has won the acclaim of critics and audiences alike. This concert will be presented at no charge, as part of Sarah and Peter Mandell’s “Hardly Strictly Classical” series. Reservations open for Members on April 6th, for the general public on April 30th. Now in its 51st season, the American Youth Symphony's mission is to inspire the future of a timeless art form. The orchestra provides paid fellowships to 100 musicians who represent extraordinary talent from all over the world.